Written by chris maroulakos on Friday, September 24th, 2010 at 10:00am. 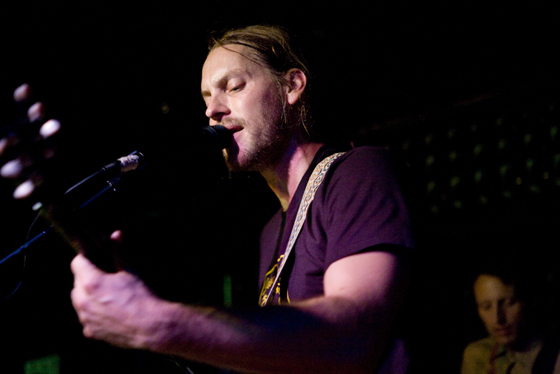 Menomena‘s sound is that of a mind wrestling with its demons. Their songs careen between cacophony and quietude like an agitated stream of consciousness. The music swells and darkens but, just when it seems as if the demons will win, the band reins in the discord, and serenity is — at least for the moment — restored. Menomena’s mastery of chaos is one of their greatest strengths but, at their recent Casbah show, some real life chaos threatened to derail their performance. The night got off to a promising start, with Brooklyn band Suckers proving themselves a worthy opener. Their material was a jubilant combination of dance beats, bass effects, and whistled/cooed/shouted melodies. Some Beirut-esque trumpet intros lent the songs an epic scope, while the band’s assured use of keyboards and programmed beats kept the energy high. Singer Quinn Walker, decked out in a mystical hipster wardrobe that consisted of a sparkling headband, silver fish necklace, and requisite wolf-howling-at-the-moon shirt, was a charismatic front man, belting out falsettos that made Deborah Harry in “Heart of Glass” sound like Barry White. He praised the audience for its enthusiasm and, in an impressive feat considering the Casbah’s low ceiling, twice leapt into the throng for some good old-fashioned crowdsurfing. Following Suckers’ charged set, Menomena took to the stage. The Portland band has a reputation for eccentricity but, save for the twin baby doll heads mounted to the PVC piping on Danny Seim’s drum set, the four-piece approached their set with a subdued professionalism and intense focus. Songs like “Queen Black Acid” and “TAOS” — both from the recently released Mines — demonstrated Menomena’s skill at using slow builds, start/stop percussion, and whimpered vocals to create a disphoric, restless mood. Hard-working front man Justin Harris not only provided the lion’s share of the vocals, but also — often simultaneously — played a tugboat saxophone and a bass-note pedal board. The band’s skill was undeniable, and there was no reason to believe the set wouldn’t finish as strongly as it had started. Unfortunately, the evening took a bizarre turn when Suckers’ Walker, now good and hammered, began to pester the band to let him sing with them. Menomena tried to ignore him, but eventually he climbed on stage, only to be grabbed by Casbah security. The band waved off the guard, but moments later the sloshed Walker fell forward, shattering the dozen drink glasses that were scattered around the stage. Security allowed Walker to rejoin the audience, but Menomena remained visibly perturbed by their tour mate’s shenanigans. The band soldiered through the rest of its set — which included renditiions of “Muscle ‘N Flo” and “The Pelican” from 2007’s excellent Friend and Foe — but whatever feeling of fun that had existed before Walker’s bout of jackassery was gone. They finished their set, mumbled a thank you to the audience, and hurried off the stage. The crowd’s clamoring for an encore went ignored, and the evening ground to an anticlimactic halt. Hopefully the next time Menomena go on tour, the opening band will be able to hold its liquor. f*cking brilliant band. phenomenal show regardless of mr. hammered's disturbances.